Blu-ray Announcement and Pre-Order: ‘The Marine 5: Battleground’! In what looks like to be the BEST film of the year, ‘The Marine‘ is on its 5th installment, which is headed direct to Blu-ray and DVD on April 25th, but will be available for HD streaming on March 28th. The first ‘Marine‘ film came out eleven years ago in 2006 and starred John Cena as a marine who gives the Attitude Adjustment to terrorists. Solid gold entertainment, Jerry. Solid gold. That first film cost $15 million, but only made $22 million at the box office. I guess that was enough to have WWE Studios create a franchise, which now we are on Part 5 with Mike ‘The Miz‘ as Cena’s replacement. 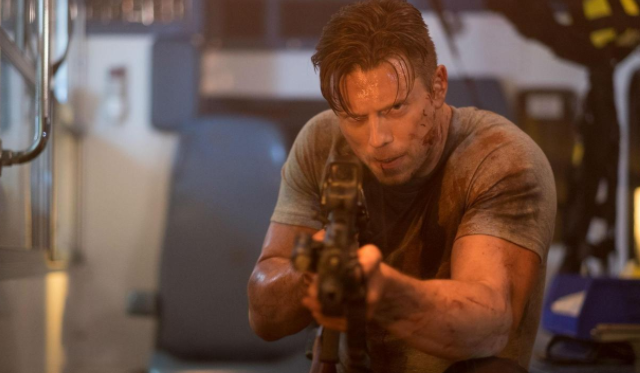 Well, in my opinion, Cena was just warming up the character and role for ‘The Miz‘, because Miz is on fire in this film franchise as he’s played ‘The Marine’ in the last three films. In this 5th film, it looks like The Miz is now an EMT, but needs to protect someone from a vicious biker gang. Now if that doesn’t have Oscar written all over it, I don’t know what does. I can’t wait. More WWE Superstars than ever before come together for the non-stop action adventure, THE MARINE 5: BATTLEGROUND, debuting on digital March 28 and on Blu-ray™ and DVD April 25 from Sony Pictures Home Entertainment and WWE Studios. The fifth installment of the Marine franchise stars WWE Superstar Mike “The Miz®” Mizanin as Jake Carter, a marine who is now back stateside working as an EMT. After responding to a distress call, he must protect a man from a biker gang out for the ultimate revenge. 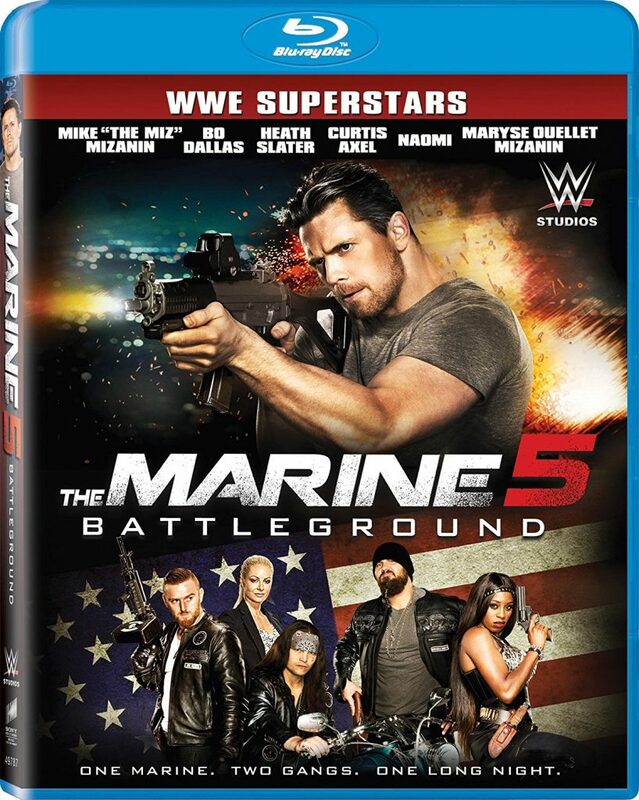 THE MARINE 5: BATTLEGROUND also stars WWE Superstars Curtis Axel®, Bo Dallas®, Maryse®, Naomi™, and Heath Slater®, and actress Anna Van Hooft (Warcraft). THE MARINE 5: BATTLEGROUND comes with two behind-the-scenes featurettes that bring fans to action ground zero. In “Evening the Odds,” fans discover that an amusement park isn’t all fun and games when the cast and Mike ‘The Miz’ Mizanin walk through how his character uses the setting to thwart off his enemies. “Superstar Studded” offers fans interviews from their favorite WWE Superstars, including The Miz, Curtis Axel, Heath Slater, Maryse and Naomi. 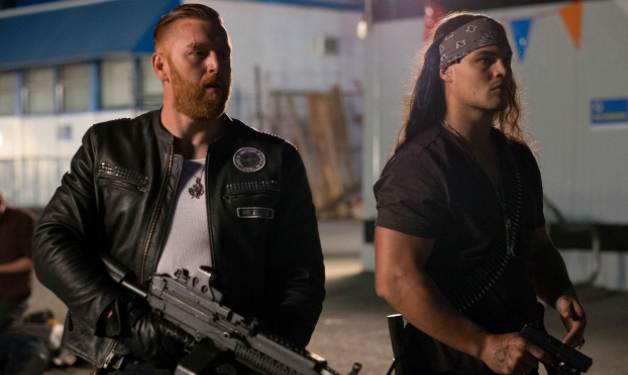 After returning stateside and now working as an EMT, Jake Carter (Mike “The Miz” Mizanin) finds himself trapped with an injured, marked man he’s sworn to save. As a ruthless biker gang bent on revenge gains speed, Carter must use his killer Marine instincts to end the rampage . . . or die trying! THE MARINE 5: BATTLEGROUND has a run time of approximately 90 minutes and is rated R for Strong Violence, and for Language. WWE’s Raw 2/15/16: Fast Track to Fastlane! WWE: WRESTLEMANIA 31 Recap!! NEW WWE WORLD HEAVY WEIGHT CHAMPION: SETH ROLLINS!!! WWE Raw 2/22/16 Recap!!! HERE COMES THE MONEY! WWE: Raw 4/27/15 Recap!! First Round of the King of the Ring Tournament!!! This entry was posted on Tuesday, February 14th, 2017 at 2:33 pm	and is filed under Film, News. You can follow any responses to this entry through the RSS 2.0 feed. You can skip to the end and leave a response. Pinging is currently not allowed. « Just What is ‘Extortion’? [to Stark after Stark thanks him for saving his life] Don't waste two lives.